It’s a new year! I love the beginning of the year (as I have stated). I get all energized and excited about the things I will accomplish in the coming year! I know you are all super excited about that-but I really was! Granted- most of you don’t have as many as I do (these aren’t even all of them!) But, I was so excited to try out this little Pinterest trick! I put a rubber band around the brush, then went behind the bar that I normally hang my towels on, and brought one end over the bar onto the brush… VOILA! Perfect drying! 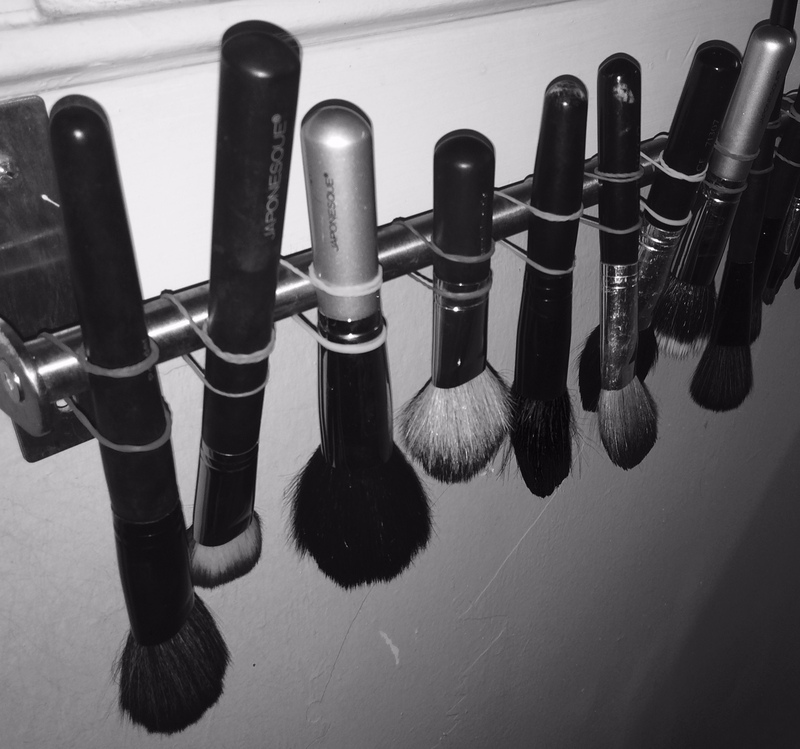 I think we often ignore cleaning our makeup brushes. I used to be under the assumption that they were MY makeup brushes, I didn’t share them, so why did I need to wash them often? Um… bacteria. That is why. Not keeping your makeup brushes clean will also add to any issues you have with skin breakouts. My makeup brushes are professional grade, so they can stand up to a bit more cleaning than regular brushes, and because I use them on clients, I clean mine with dawn and vinegar. The vinegar is a great natural disinfectant, and dawn is a gentle enough cleanser to not damage the natural bristles in my brushes. However I normally recommend to use a gentle shampoo. HOW? Use warm water, get a little shampoo in your hands, and gentle roll your brush around in your hand. Rinse and repeat until the suds rinse white (or clear). Then hang those babies to dry like I did! It was the easiest way to dry, that I have tried yet! HOW OFTEN? I’d say weekly, but that may be a bit over zealous for some. I choose to because I personally have always dealt with skin issues. If you don’t, then you are probably fine doing it every other week. You also have to take into consideration how often you are using them. So, it’s a new year- clean those brushes and start the year off eliminating one possible culprit for bad skin! Tags: Advice, Beauty, Brushes, Cleaning, dawn, Makeup, natural, newyear, Pinterest, Skin, tips, tricks, vinegar. Bookmark the permalink.